We're eating breakfast before packing our bags for the flight home. I had a strange dream last night. There was a toll gate on some popular thoroughfare that lots of people had to pass through. The toll was 50 cents, but if you paid 10 cents extra you got a serve of fried bacon. So everyone always paid 60 cents because, hey, 10 cents for fried bacon! We're in the hotel lobby, just waiting for our airport transfer. 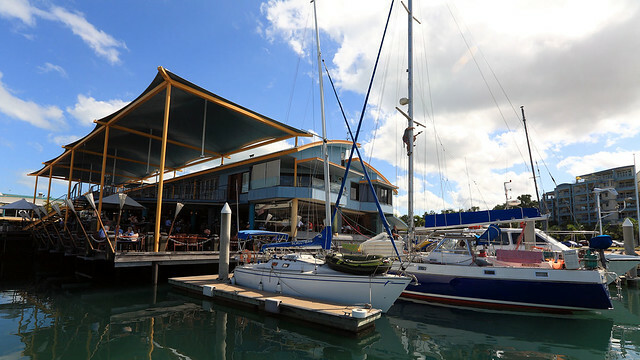 We spent a leisurely morning after packing our bags and checking out over at Cullen Bay Marina - a posh marina complex in Cullen Bay, one of Darwin's swanky suburbs. We caught a taxi over at about 09:30. The fare was $9.10 but the driver rounded it down to $9 rather than making complex change. A nearby book store offered a cool retreat and we browsed briefly before exiting on the marina side where a string of cafes and restaurants faced out on to the wharf and the assemblage of moored yachts. The Buzz Cafe tempted us with shade and lounge seating, where we claimed a spot and perched for the next hour and a bit. 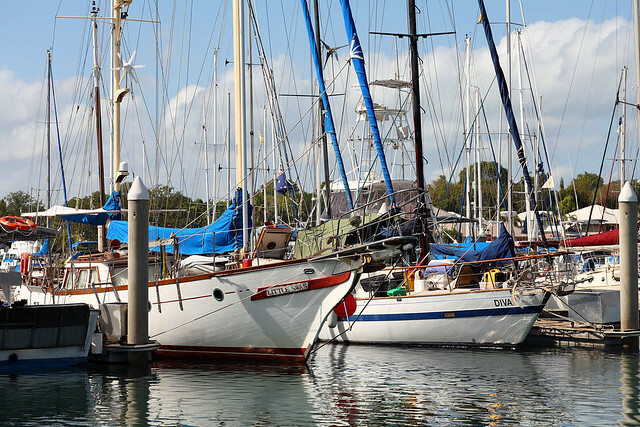 I wandered around the marina to snap some photos of the yachts and other nautical paraphernalia, while M. ordered a coffee (the "best in Darwin" according to the Lonely Planet) and a croissant. The croissant was slow in coming, the coffee even more slow, but we were in no hurry at all and M. confirmed the coffee was indeed very good. Apparently the story was they had run out of cups, and everyone had to wait for their coffees! We also sipped cold water to keep ourselves hydrated, which necessitated a visit to the men's room, where the Lonely Planet cryptically commented "all will be revealed". 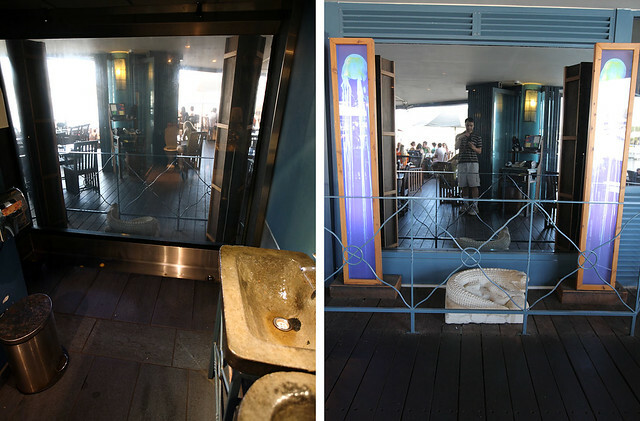 Entering the men's facilities, at first I noticed nothing particularly unusual, until I turned to look at the urinal, which was a stainless steel trough on the floor set against a wall of smoky glass which afforded a panoramic view directly out into the cafe and the marina beyond. I could see dozens of people sitting at their tables enjoying their Sunday brunches. Realising it must be a one-way mirror, I stepped up and was just about to unhitch the pants, when a waitress walked by just a metre or so from the presumed mirror on the other side, and turned to look straight at me at she passed. This was enough to send me scurrying for the security of a stall. Leaving the toilets, I looked carefully at the mirror on the outside (which I'd barely noticed going in) and confirmed to my satisfaction that nobody could see in. This called for further investigation. M. checked the female toilets, reporting that no such window existed there. But the toilet seats were clear resin with real spiders set into them, although she managed to find one with seashells which was less objectionable. For the next hour or so, we downed cold water so I could have another go at the Glass Wall of Terror. Just before we left, I braved the wall again. I was steeled and ready, and stepped up to the trough - which triggered a cascade of water flushing down the inside of the glass! Convincing myself mentally that this would not alter the optical properties of the one-way mirror, I managed to accomplish the mission while observing the cafe patrons casually enjoying their coffees right in front of me. I suspect the waitresses there often glance into the mirror, knowing the effect it will have on new male patrons on the other side. Just before 12:00, we returned briefly to the book store so M. could buy a crocodile print calico bag she'd seen earlier. 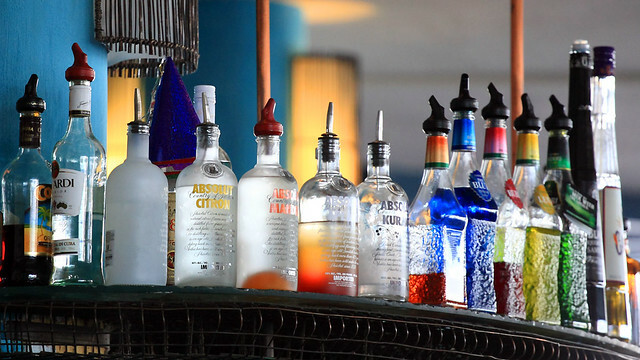 Then we went to the Yots Greek Taverna a few doors down along the marina for a light lunch. 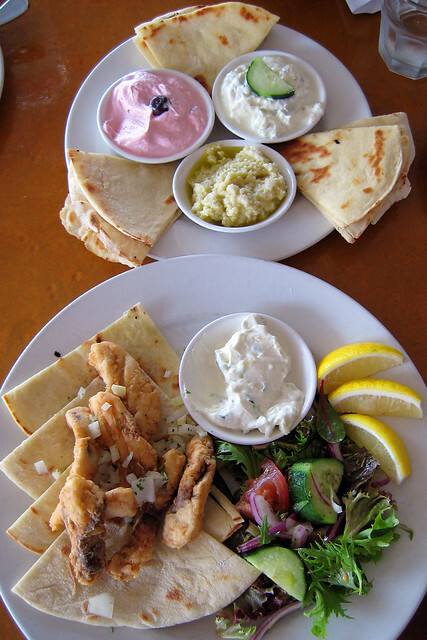 We had a trio of dips with pita bread - tzatziki, taramasalata, and one made of potato, olive oil, and garlic - and a barramundi yeeros. It was all excellent. As I paid the bill, I asked if we were liely to pick up a taxi on the street and the guy who looked like the owner of Yots said he'd call one for us. A few minutes later we were on our way back to the hotel. The fare this time was $10.10, an the driver rounded it down to an even $10. We picked up our left luggage and relaxed for a while in the piano lounge (no piano player) until our airport shuttle arrived. There's not much more to tell. The shuttle bus came and picked us up and we had an uneventful trip home. For reading on the plane I bought a copy of Midnight Oil's book Strict Rules - the story of the Blackfella-Whitefella tour they did of the Northern Territory in 1986. It was interesting reading of them touring some of the same places we'd seen on our trip just ended, and of their experiences interacting with the local Aboriginal communities along the way. Last updated: Wednesday, 23 January, 2019; 12:56:55 PST.